There's apparently a show about a master cake-maker in Hoboken who makes these awesome cakes. I think it's called "Cake Master." So these fellas show up in their van to the New York Auto Show with a giant cake that looks like a Bumblebee Camaro. Pretty cool, eh? You'd think so. But then they freak out like 'Oh no, you're gonna ruin the show' and 'You can't run a photo of the cake before the show airs.' 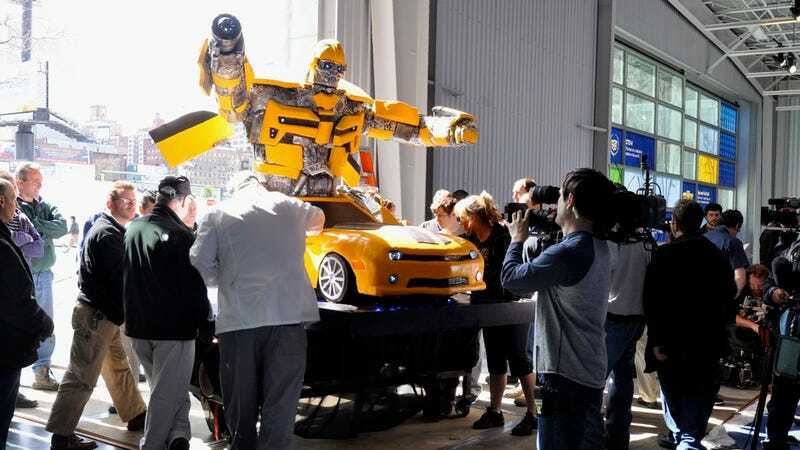 Here's a tip: don't wheel a cake that looks like Bumblebee into a room full of cameras, then, maybe? So here we are, proudly ruining an episode of "Cake Chief" with this unauthorized photo of the Bumblebee cake. We think cakes should be free to be seen. Because this is America. We love cake as much as we love freedom. Maybe more.